Potential Rental Income $600 USD. All units completed, fully furnished including appliances and A/C's. All Units with Tenants in Place (Rented for $600/mo.). All units have private balcony/terrace. The community fees will run approx. $70-$80 per month and include all common area electricity, landscaping, pool maintenance, trash pick up, common gas, 24 hr security. Prices should be very comparable to Phase I. This is an investment opportunity not to be missed! 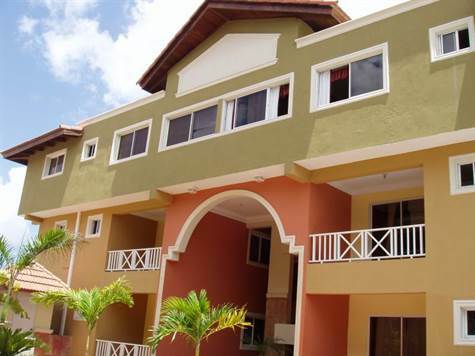 Brand new condos for sale on the best beach of Punta Cana called Bavaro Beach and are only 10 minutes from the beach and 15 minutes from the Punta Cana Airport. There is a brand new high end mall 10 minutes away where Hard Rock Punta Cana, Rolex, Monte Cristo Cafe among others. Bavaro-Punta Cana is the #1 Caribbean Destination home to over 50 all inclusive hotels and resorts. PRICING, AVAILABILITY AND CONDITIONS SUBJECT TO CHANGE WITHOUT NOTICE.